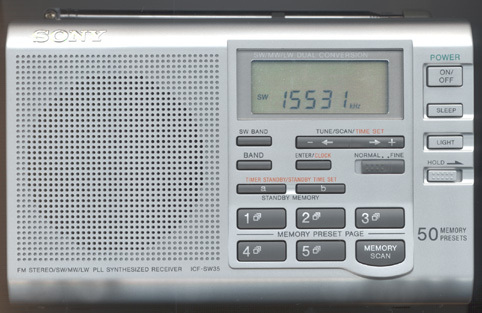 The Sony® ICF-SW35 is a stylish digital portable that covers: longwave (150-285 kHz), AM (530-1710 kHz), FM (76-108 MHz) and shortwave from 2250 to 26100 kHz. This model employs a dual conversion superheterodyne circuit (except FM band) for good sensitivity and image rejection. FM Stereo is provided to the earphone jack. 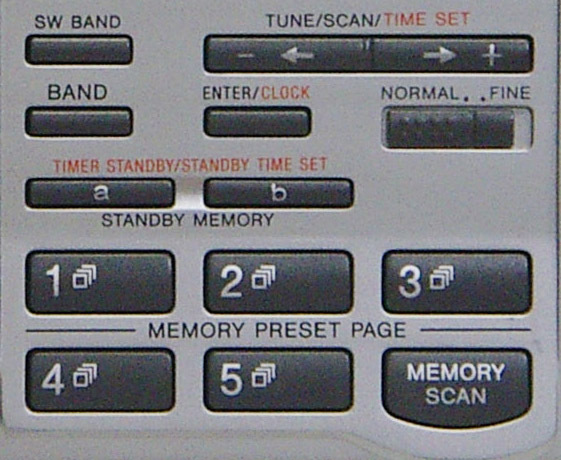 Tuning is accomplished via UP/DOWN buttons, 50 memory presets or automatic frequency scan. The memories are organized in 5 pages of 10 presets each. These memories are non-volatile and therefore will not be lost during the changing of batteries. The ICF-SW35 features a built-in digital clock with two wake times and 60 minute sleep timer. PLL quartz frequency synthesis and dual conversion superheterodyne circuitry combine to offer solid performance. Step tuning may be set for 1 or 5 kHz on shortwave. The ICF-SW35 has: a dial illumination button, sleep button, lock switch, 9/10 kHz MW step switch, memory scan and a 2.125 inch (66 mm) speaker. 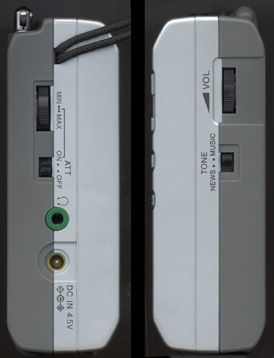 The side of the radio features a variable attenuator, tone switch and stereo earphone jack. 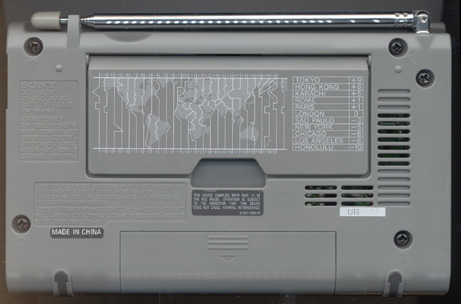 The back panel features a snap-out flip-stand. Requires three AA cells (not supplied) or 4.5 VDC. The stylish case is silver in color. 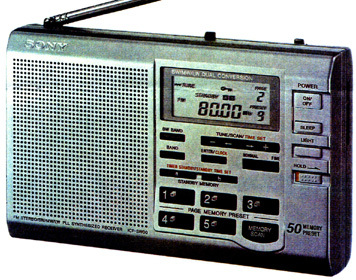 This radio includes a cloth carry case, wrist strap and Sony Shortwave Guide. Only 6.7 x 4.5 x 1.4 inches 15 oz. (169x112x35mm 405g). One year limited warranty. Copyright 2000-2016 Universal Radio, Inc.